"What's Christmas but a time for finding yourself a year older and not a day richer. There's nothing merry in that. If I could work my will, every idiot who goes about with Merry Christmas on his lips should be boiled with his own pudding and buried with a stake of holly through his heart." Back in 1970, I was an impressionable, wide-eyed 8-year-old, and when my parents allowed me to skip school so we could go to New York City's Radio City Music Hall to see the new movie Scrooge, I thought Christmas had come early. I still remember sitting in the balcony of that massive cathedral of a theater, drinking in the sights, sounds, and energy of the live stage revue that preceded the film. (The high-kicking Rockettes, of course, stole the show.) At the time, I knew little, if anything, about Charles Dickens' A Christmas Carol, but Scrooge enchanted me with its story, songs, spectacle, and irrepressible holiday spirit. I left Radio City feeling the kind of elation only good musicals can inspire. For years, I believed my love of Scrooge had more to do with that wonderful childhood experience than the film itself, but after watching Paramount's sumptuous DVD, I can honestly say Scrooge is even better than I remembered. Decked out with a lush, spotless transfer and crystal clear multi-channel sound, Ronald Neame's infectious musical treatment of Dickens' classic will undoubtedly become�for my family, at least�an instant and enduring holiday tradition. Almost everyone knows the tale of the crusty, bitter miser Ebenezer Scrooge (Albert Finney), whose disdain for mankind and yuletide joy conjures up a Christmas Eve visit from the ghost of his business partner, Jacob Marley (Alec Guinness). Marley hopes to spare Scrooge an unfortunate afterlife by helping him become a more caring and generous human being. Three spirits�the Ghost of Christmas Past (Edith Evans), the Ghost of Christmas Present (Kenneth More) and the Ghost of Christmas Yet-to-Come (Paddy Stone)�visit Scrooge during the night, transporting him back to the seminal events that shaped him, and offering disturbing visions of what his future might hold if he continues on his greedy, cold-hearted path. When he "awakens" on Christmas morning, a rejuvenated Scrooge giddily mends fences with those he has badgered and wronged. Although some purists may find the idea of a song-filled Christmas Carol distasteful, even blasphemous, I am constantly struck by how well Dickens' classic works as a musical. The slow ballads add extra poignancy and emotion to the tale, while the rousing ensemble pieces lend the film a festive, exhilarating flavor that eclipses other versions. Credit composer-screenwriter Leslie Bricusse for seamlessly weaving his melodic, hummable score into the action. Songs such as "Father Christmas," "I Like Life," "Happiness" and the toe-tapping "Thank You Very Much" enhance the emotional shadings of the characters and spark the various stages of Scrooge's transformation. Finney leads a superstar gallery of distinguished British actors and totally inhabits the irascible, ultimately lovable Scrooge. To think that Finney was just 34 years old when he tackled the role of the elderly curmudgeon makes his performance all the more impressive. Makeup artist George Frost helps immeasurably to put over the illusion, but Finney loses himself in the part, filling his performance with subtle nuances and a heartbreaking melancholy that make Scrooge a three-dimensional character instead of the customary caricature. 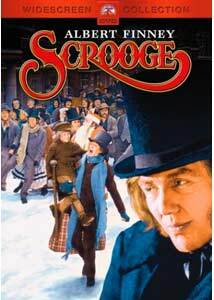 He also performs double duty, portraying Scrooge as a young man�a feat no other movie Scrooge can claim. A few very effective processed shots allow the two Finneys to share the screen, strikingly illustrating the actor's virtuosity. Sure, the film stumbles at times. Whenever Scrooge strays too far from Dickens' novel, it loses credibility. An extended sequence of Scrooge in hell adds an unwelcome cartoon quality to the story, despite a couple of amusing bits and the welcome return of Guinness (whose gravelly-voiced Marley is a highlight). Ditto Scrooge's impersonation of Santa Claus during the final musical number. Colorful? Yes. Necessary? Hardly. Yet because Scrooge is a musical, one can more easily forgive such faults. The sets and songs often bring Oliver! (released just two years earlier) to mind, but director Neame's masterful pacing, dramatic sensitivity and command of the musical numbers allow Scrooge to stand on its own. Having just come off The Prime of Miss Jean Brodie (which won Maggie Smith an Oscar�), the underrated Neame would further prove his versatility with his next project, The Poseidon Adventure. Scrooge has never been included on the short list of essential holiday films, but hopefully this exceptional DVD release will right that wrong. Alastair Sim may well remain the finest movie Scrooge, but Albert Finney gives him a run for his money and helps make this Scrooge a true Christmas classic. Image Transfer Review: After seeing faded, severely cropped snatches of Scrooge on TV over the years, I had forgotten how lush and expansive the film looks in its original widescreen form. Paramount provides an impeccable anamorphic transfer, with only a speck or two of debris dotting this 33-year-old musical. Images are crisp and bright, featuring natural fleshtones, lovely shadow detail and vivid, stable hues. The drab pallor of Scrooge's rundown office and dilapidated flat are beautifully contrasted by the more colorful memories of the miser's youth. Even the relatively primitive special effects are well integrated, with only one or two possessing a processed look. Scrooge has surely never looked better and this transfer will impress even the film's most discriminating fans. Audio Transfer Review: Both DD 5.1 and Dolby stereo tracks are included, providing full, rich sound without any detectable defects. The 5.1 option doesn't make proper use of the rear speakers, but the sound plays nicely across the front channels, while the ghostly special effects allow the subwoofer ample opportunity to shine. Dialogue can be a bit soft at times, but is always understandable, and the musical numbers fill the room with solid fidelity. Paramount also includes the film's original overture�a classy touch, but also one that can be skipped, if desired. Extras Review: Here's the one area where Paramount continues to come up short. As with most of its catalogue titles, no extras are included. Although most of the principals in Scrooge are deceased, an audio commentary featuring director Ronald Neame (author of a new autobiography) and star Albert Finney would have added substance and perspective to the disc. If you've never seen Scrooge, you're in for a real holiday treat. This musical adaptation of Dickens' A Christmas Carol succeeds across the board, with delightful songs, exhilarating staging and top-notch performances from some of Britain's most honored actors. Paramount has trimmed this yuletide disc with a gorgeous transfer and excellent sound, giving fans a much-appreciated Christmas present that will be enjoyed year after year. Highly recommended.